Whether striving to protect citizens from financial risks, climate change, inadequate health care, or the uncertainties of the emerging "sharing" economy, regulators must routinely make difficult judgment calls in an effort to meet the conflicting demands that society places on them. 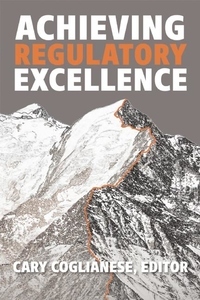 Achieving Regulatory Excellence offers guidance from leading international experts about how regulators can set appropriate priorities and make sound, evidence-based decisions through processes that are transparent and participatory. With increasing demands for smarter but leaner government, the need for sound regulatory capacity--for regulatory excellence--has never been stronger. In addition to chapters by editor Cary Coglianese, and a foreword by Jim Ellis, president and chief executive officer of the Alberta Energy Regulator, contributors include Robert Baldwin (London School of Economics and Political Science), John Braithwaite (Australian National University), Angus Corbett (University of Pennsylvania), Daniel Esty (Yale University), Adam Finkel (University of Pennsylvania and University of Michigan), Ted Gayer (Brookings Institution), John Graham (Indiana University), Neil Gunningham (Australian National University), Kathryn Harrison (University of British Columbia), Bridget Hutter (London School of Economics and Political Science), Howard Kunreuther (Wharton School at the University of Pennsylvania), David Levi-Faur (Hebrew University of Jerusalem), Shelley H. Metzenbaum (Volcker Alliance), Donald P. Moynihan (University of Wisconsin-Madison), Paul R. Noe (American Forest and Paper Association), Gaurav Vasisht (Volcker Alliance), David Vogel (University of California-Berkeley), and Wendy Wagner (University of Texas School of Law).